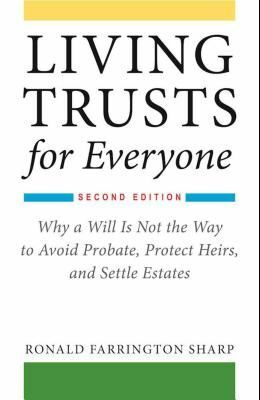 Readers say it best: Very informative, saved me a lot of money and headaches , recommend it for everyone who has to plan estates for their elderly parents Living Trusts for Everyone is the best resource for setting up a living trust. Explaining in specific terms what benefits a trust will have, Ronald Farrington Sharp gives the tools necessary to set up a loved one's trust with no lawyers and no expense. Wills benefit lawyers. Trusts benefit the clients. Too often lawyers sell wills to clients only to sit back and wait to sell their probate services to their clients' heirs. Ronald Farrington Sharp describes the best way to handle modern estate planning and details the many advantages trusts have over wills in not only eliminating probate but in also protecting your assets for your heirs. Sharp explains why legal services are not needed to do the clerical work in settling a trust after death. This updated edition includes new information on an array of subjects, including: Elimination of the federal estate tax for most estates due to increased exemption amounts Online assets The use of passwords, usernames, and websites Keeping trustees honest and the process of removing trustees for malfeasance Forms for simplifying the planning process Strategies to lower attorneys' fees With no legal jargon, just step-by-step instructions and sample form letters, Living Trusts for Everyone takes the mystery out of the process of setting up a trust.